You'll also need a cupcake mold and liners or cooking spray. Line the molds with the cupcake liners or sprinkle with cooking spray. Use a blender or food processer to grind the fiber one cereal until it falls apart. Mix the cereal, wheat flour, baking powder, baking soda, salt and cinnamon and mix well. Light beat the egg in another bowl, and then add the oil, vanilla and yogurt. Mix and pour in with the dry ingredients. Stir very lightly to mix the ingredients. Use folding motions to incorporate the carrots and apple. Mix as little as possible. The more to mix the dough, the firmer the muffins will turn out. Pour the dough into the muffin tins for 25-35 minutes or until a toothpick comes out clean when inserted. Let sit for 5 minutes. Remove from mold. Process double the amount of cereal and put the rest away for another occasion. You can also make double the amount and freeze half. If you can't find green apples, use red apples. If you want sweeter muffins, add 1/3 cup of sugar. Breakfast is the most important meal of the day, in my opinion. In my experience, if I eat well in the morning, I make better decision throughout the day. Fortunately, there are many options to add variety to your menu, so there's no excuse. Last week I decided to try something new and my kids loved it. 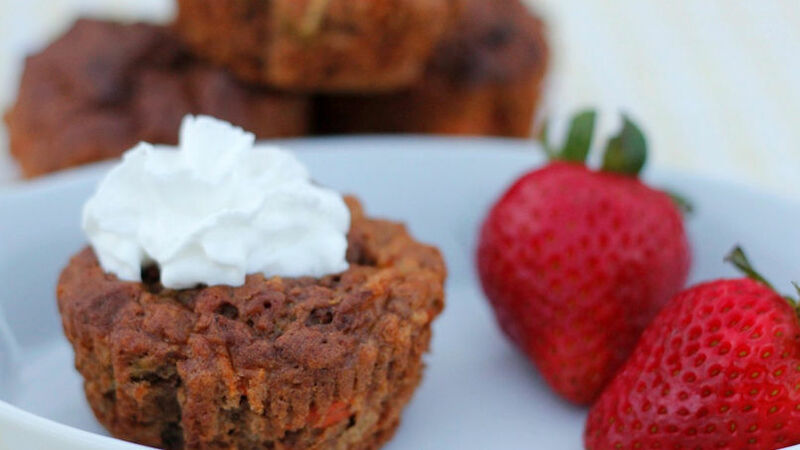 I've always enjoyed carrot cake and I thought it would be a good idea to create some whole-wheat muffins to give us fiber, but include the delicious flavor of this popular pastry; it also gives us a chance to add vegetables in a fun way. Because these muffins are more breakfast than dessert, I eliminated as much of the sugar as possible. The end result was soft, moist and subtly sweet muffins. I recommend trying them with a cup of yogurt or smoothie. They're even great alone with a bit of whipped cream.